This FRSM ultra high precision resistor series from Vishay Foil Resistors is tested to EEE-INST-002 and MIL-PRF-55342, specifically for space and military applications. The 303263 series offers a resistance range between 10Ω and 14kΩ, in a small 1206 surface-mount package with wrap-around terminations. These resistors utilise Vishay Foil Resistor's newest Z-1 Bulk Metal® foil resistor technology for improved load life stability (up to 25ppm) and higher working temperatures (balanced temperature characteristics over a range from -55°C to +150°C). They have nominal temperature coefficients of resistance of ±0.2ppm/°C typical between -55°C to +125°C (+25°C reference) with tolerances available down to ±0.01% between 250Ω and 14kΩ. This FRSM ultra high precision resistor series from Vishay Foil Resistors is tested to EEE-INST-002 and MIL-PRF-55342, specifically for space and military applications. The 303264 series offers a resistance range between 10Ω and 16kΩ, in a small 1506 surface-mount package with wrap-around terminations. These resistors utilise Vishay Foil Resistor's newest Z-1 Bulk Metal® foil resistor technology for improved load life stability (up to 25ppm) and higher working temperatures (balanced temperature characteristics over a range from -55°C to +150°C). 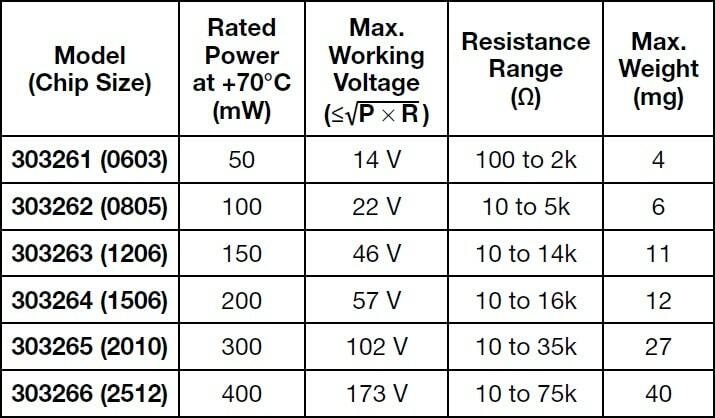 They have nominal temperature coefficients of resistance of ±0.2ppm/°C typical between -55°C to +125°C (+25°C reference) with tolerances available down to ±0.01% between 250Ω and 16kΩ. This FRSM ultra high precision resistor series from Vishay Foil Resistors is tested to EEE-INST-002 and MIL-PRF-55342, specifically for space and military applications. The 303265 series offers a resistance range between 10Ω and 35kΩ, in a small 2010 surface-mount package with wrap-around terminations. These resistors utilise Vishay Foil Resistor's newest Z-1 Bulk Metal® foil resistor technology for improved load life stability (up to 25ppm) and higher working temperatures (balanced temperature characteristics over a range from -55°C to +150°C). They have nominal temperature coefficients of resistance of ±0.2ppm/°C typical between -55°C to +125°C (+25°C reference) with tolerances available down to ±0.01% between 250Ω and 35kΩ. This FRSM ultra high precision resistor series from Vishay Foil Resistors is tested to EEE-INST-002 and MIL-PRF-55342, specifically for space and military applications. The 303266 series offers a resistance range between 10Ω and 75kΩ, in a small 2512 surface-mount package with wrap-around terminations. These resistors utilise Vishay Foil Resistor's newest Z-1 Bulk Metal® foil resistor technology for improved load life stability (up to 25ppm) and higher working temperatures (balanced temperature characteristics over a range from -55°C to +150°C). They have nominal temperature coefficients of resistance of ±0.2ppm/°C typical between -55°C to +125°C (+25°C reference) with tolerances available down to ±0.01% between 250Ω and 75kΩ. The FRSM ultra high precision resistor series from Vishay Foil Resistors offers a resistance range between 100Ω and 5kΩ, all in a small 0603 surface-mount package with wrap-around terminations. These resistors utilise Vishay Foil Resistor's newest Z-1 Bulk Metal® foil resistor technology for improved load life stability (up to 25ppm) and higher working temperatures (balanced temperature characteristics over a range from -55°C to more than 175°C). They have nominal temperature coefficients of resistance of ±0.05ppm/°C typical between 0°C to +60°C and ±0.2ppm/°C typical between -55°C to +125°C (+25°C reference) with tolerances available down to ±0.01% between 250Ω and 5kΩ. The FRSM Z1 ultra high precision resistor series is also available as EEE-INST-002 compliant for space use. Please see the separate FRSM EEE (space qualified) product pages for further information. Non-standard technical requirements such as resistance outside of standard range, lower tolerance or TCR are available upon request. Please contact us for further information and availability. (1) For tighter TCR and/or resistance values up to 150k, please contact Application Engineering. The FRSM ultra high precision resistor series from Vishay Foil Resistors offers a resistance range between 5Ω and 8kΩ, all in a small 0805 surface-mount package with wrap-around terminations. These resistors utilise Vishay Foil Resistor's newest Z-1 Bulk Metal® foil resistor technology for improved load life stability (up to 25ppm) and higher working temperatures (balanced temperature characteristics over a range from -55°C to more than 175°C). They have nominal temperature coefficients of resistance of ±0.05ppm/°C typical between 0°C to +60°C and ±0.2ppm/°C typical between -55°C to +125°C (+25°C reference) with tolerances available down to ±0.01% between 250Ω and 8kΩ. The FRSM ultra high precision resistor series from Vishay Foil Resistors offers a resistance range between 5Ω and 25kΩ, all in a small 1206 surface-mount package with wrap-around terminations. These resistors utilise Vishay Foil Resistor's newest Z-1 Bulk Metal® foil resistor technology for improved load life stability (up to 25ppm) and higher working temperatures (balanced temperature characteristics over a range from -55°C to more than 175°C). They have nominal temperature coefficients of resistance of ±0.05ppm/°C typical between 0°C to +60°C and ±0.2ppm/°C typical between -55°C to +125°C (+25°C reference) with tolerances available down to ±0.01% between 250Ω and 25kΩ. The FRSM ultra high precision resistor series from Vishay Foil Resistors offers a resistance range between 5Ω and 30kΩ, all in a small 1506 surface-mount package with wrap-around terminations. These resistors utilise Vishay Foil Resistor's newest Z-1 Bulk Metal® foil resistor technology for improved load life stability (up to 25ppm) and higher working temperatures (balanced temperature characteristics over a range from -55°C to more than 175°C). They have nominal temperature coefficients of resistance of ±0.05ppm/°C typical between 0°C to +60°C and ±0.2ppm/°C typical between -55°C to +125°C (+25°C reference) with tolerances available down to ±0.01% between 250Ω and 30kΩ. The FRSM ultra high precision resistor series from Vishay Foil Resistors offers a resistance range between 5Ω and 70kΩ, all in a small 2010 surface-mount package with wrap-around terminations. These resistors utilise Vishay Foil Resistor's newest Z-1 Bulk Metal® foil resistor technology for improved load life stability (up to 25ppm) and higher working temperatures (balanced temperature characteristics over a range from -55°C to more than 175°C). They have nominal temperature coefficients of resistance of ±0.05ppm/°C typical between 0°C to +60°C and ±0.2ppm/°C typical between -55°C to +125°C (+25°C reference) with tolerances available down to ±0.01% between 250Ω and 70kΩ. The FRSM ultra high precision resistor series from Vishay Foil Resistors offers a resistance range between 5Ω and 125kΩ, all in a small 2512 surface-mount package with wrap-around terminations. These resistors utilise Vishay Foil Resistor's newest Z-1 Bulk Metal® foil resistor technology for improved load life stability (up to 25ppm) and higher working temperatures (balanced temperature characteristics over a range from -55°C to more than 175°C). They have nominal temperature coefficients of resistance of ±0.05ppm/°C typical between 0°C to +60°C and ±0.2ppm/°C typical between -55°C to +125°C (+25°C reference) with tolerances available down to ±0.01% between 250Ω and 125kΩ.